This week on Big Brother Canada the girls tried once again to get out Heather and ended up back-dooring one of their own. Every year they say it and it's true. All girls alliances never work. Rachelle won HoH and nominated her nemesis Heather and the new girl Allison. Allison wins the veto because Heather doesn't know how to play and takes herself off of the block. Sabrina was able to convince Rachelle to back-door Ika if the chance presented itself - it did and Ika went up. Ika knew she was going home, so when she won a competition that allowed her to either give houseguests letters from home or take $5,000 for herself, she choose the latter. Ika started talking out loud about all of the houseguests and if any of them would vote to keep her if she did give them the letters. It was not pleasant. Of course the houseguests were in the house watching her on the TVs say all of these things about them. It was Topaz from season one all over again. 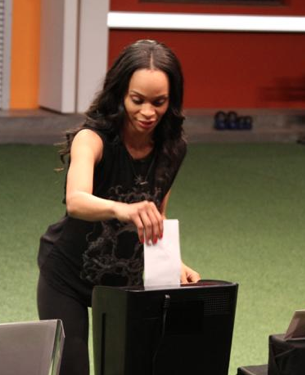 Ika shredded all of their letters from home as the HGs stood in rage. When the door to the backdoor opened, angry houseguests awaited. Ha. It was awesome. Of course, after that there was no way she was staying and Ika was sent packing. After Ika left the house we chatted about game power, her decision to shred the cheques and who will be the most surprised to find out Kenny is gay. Jes: Choosing the $5,000 instead of giving out the letters sealed your fate of eviction. What do you think your chances would have been if you gave the letters to the houseguests? Ika: I was backdoored! There wasn't even a chance. Even if I thought there was a 20 percent chance that they would keep me, I would have shredded the cheque. But since I knew I was going home, I thought I'm going to go home with my cheque! I would have done the same. Give me my money. Jes: At this point in the game, which houseguest do you think has the most power in the house? Ika: I think Adel does because Canada loves him and they're behind him. The move Canada makes this week will help Adel's game. Seriously? I understand that Canada received the HoH powers this week, but that doesn't mean that Adel has power. Jes: Kenny has strategically hidden the fact that he is gay from the other houseguests, who do you think would be the most surprised by this revelation? Ika: Omg - all of them! He has everybody fooled. But let me think. In a situation like this though, it's the people you're closest to. So I think Andrew will be most shocked. I think Andrew as well. And/or maybe Sabrina.